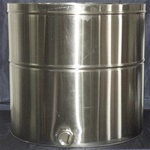 Stainless steel storage tanks for candle making and soap making. WaxMelters offers a full line of quality food grade, stainless steel storage tanks for your candle making and storage needs. 25 Gallon Stainless steel, food grade storage tank with stainless steel cover for candle making, soap making and storage needs.